In fact I learned a few things from the exhibition, as always it doesn’t matter how organised you are something under the conditions of stress involved in installations will create at least one thing to go wrong, so you need a contingency ie installing at a time when the local hardware shop is open just in case I forget to pack the right screws (that’s happened) and make sure I have some loose change or a bank card to pay for anything required. I have driven to the Number 8 Gallery a few times to do a reconnaissance on the space so I felt very confident that I knew the way with my eyes closed so I didn’t bother switching on the satnav, and while I was talking to my friend we went straight past the M6 Motorway junction, I noticed the Pershore sign on the road that we should be on, but the only solution is to carry on down the motorway to do a u-turn. That was the only problem that we experienced during the installation, and perhaps one that can’t be covered by a contingency. When installing big artwork its ideal to have one small person (me at 5ft 2) and another person who’s at least a foot taller. Libor is a friend of mine from the Czech Republic who has helped me many times before he’s great with all kinds of DIY and I found this out a few years ago when he helped me do an installation in a To Let unit at the Manders Shopping Centre in Wolverhampton. I think I would be there to this day without his strength and expertise. Unfortunately for me Libor is forging a successful career for himself in IT and only comes to Birmingham for a holiday so I need to be very successful before I can persuade him to work for me full time. So something else I have learnt is make sure I do all my exhibitions when he’s on holiday. We made quite a team, me measuring and marking the wall, Libor drilling (without standing on ladders). We were so good that I thought it would a good idea to produce a video so that my customers can see the best way to mount the artwork on the wall; there is a knack that makes it a whole lot easier. I commandeered someone who was I believe waiting for a friend who was involved in rehearsals for the Christmas show to hold the video camera but video lots of storage space and my compact flash card which was only intended for the still photography didn’t have enough capacity to record the full process. I will produce a video in the future and if I do the installation on my own everyone can see how easy it is, mmmmm. When the news programmes show wars and riots around the world I wish half heartedly I admit, that I could be there dodging the bullets to capture the surfaces of burning cars and military vehicles, can you imagine the cross fire is in full flow, the heat and noise is intolerable as I crawl from the barricades to the burning mangled upturned mess of metal in my bullet proof combat jacket and helmet. Of course while I do have to keep an eye on my surroundings when photographing and I have been in situations were I have felt at risk and I keep one eye on my escape route there is no need as romantic as it sounds to jetting into flash points around the world to get my stock of images. On closer evaluation the images that I would get from those vehicles isn’t worth getting my head shot off for. To produce the conditions for a good surface to photograph I need the fireman to attend and soak the hot metal with their hose pipes, don’t think that will happen in the Lybian desert or downtown Kabul. It would also stand to reason that in dry climates there will not be the reaction from the damp in the atmosphere. This week I had the perfect scenario the trouble spots came to me in Birmingham but I also had perfect events and elements not only did the fireman attend but we had a night of rain. About 12 months ago I had this wild idea to reorganise my existence on the web, to stop blogging on my various sites and spend time planning the future strategy. The main problem and reason for this drastic pruning and remodelling was because I realised that my websites and blogs have evolved over a period of time, there is no planed framework and this led to duplication. Become a Getty Image Artist. So why am I posting now, why the change of heart. Well I never did get round to delving into code and creating new sites, or clear the kitchen table and produce artistic Mind Maps and Mandellas, the project manager software remains in the box and I thought at least with the old setup at least I’m produced something to tell the world about my art. So I’ll keep it going until I defeat this procrastination thing. 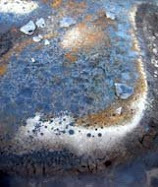 “…….Using results of the explosion; scorched metal, molten glass, fabrics, and plastics, the rust and the gallons of water from the firemen’s hose I strive to turn a negative blot on the landscape using technology, photography and oil paint to transform the textual image into a positive beautiful landscape”. And by yet another coincidence on the same day I found this set of pictures from one of my favourite sites The Big Picture This time the focus is on Florida from above. Take a look at both sites to compare the contrasting layout. This image originates from a photograph I took of a discarded panel from an old burn out, which I took home and added to the many other pieces that I have in my backgarden. No flowers, no vegetables just car bonnets and side panels in my English country garden. The BBC Viewfinder blog has a “Your Pictures of The Week” feature, there is a different subject for submitted photographs to be based on and as this week the subject was “Metal” I felt compelled to contribute this image. Working as an artist I often think recognition like this is as good as selling a piece of my artwork, of course it is different because job satisfaction doesn’t pay the bills but if I can keep an even balance between the two achievements I very happy. I have been involved in the 365 project during 2009 the aim is to take a photograph everyday on any subject and then upload it to Flickr. On the 31st December I completed the project by recreating the photograph I came across on 31st December 2008 that made me say “I want to try that” unfortunately that original has been lost in the ether of the internet because I didn’t realise the great significance to my future at the time. Year Two began on a freezing cold hilltop overlooking the firework display across the city of Birmingham at midnight. The image itself didn’t work out the way I wanted but the significance of the time, the date and the place made it more meaningful. During the year I noticed an article on BBC Viewfinder by the editor Phil Coomes whom had begun his own photo a day challenge. Phils project is exclusively produced using Kodachrome 64 film and because of his chosen media he has to allow for the delay between finishing a roll, sending it to the US for processing, and then scanning, he is going through this torturous route to mark the death of Kadachrome, 75 years after its introduction, as the last processing laboratory handling the film will no longer offer the service. A combination of a full moon, and car park lights turned the kids playground into an ideal setting for some night time photographs to use for my 365 project. Just as I started to take some shots of the playground a couple of young lads turned up and promptly parked their bikes between me and subject after I had spent some time carefully looking for the best shot. Somehow I felt uncomfortable and thought perhaps there might be some confrontation even thinking my camera is at risk, although I am used to this exposure when I’m photographing the burnt out cars. I find the best form of defence is to engage people and explain what I’m doing and why so that they take some interest in this strange man with his camera. They didn’t seem that interested in what I was doing and I heard one mutter something that “Miss so and so would say that was great” I presume Miss was a teacher. I enquired if they had seen any Burnt Out Cars on the park knowing they would say no because the burn outs are few and far between at the moment. I also pass the park regular and look across the open space to were in days gone by I would see the rusting wrecks - Happy Days. But to my great surprise yes there had been a dumped car over in the overgrown area far from the main road, so that’s why I missed it. I was half annoyed and half very relieved, annoyed because I had missed it but relieved because torching cars still goes on in the area and who knows I might see a revival. The lads were playing football using great light conditions and the walls of the play area (to save them having to keep fetching the ball) and once they forgot about me and my camera they began expressing themselves with trick shots backwards and forwards over the wall, and aiming for the basketball basket. Returning home I evaluated that perhaps although they had this apparent couldn’t care about art strut about them, they did put my business card with a picture of my artwork in their pocket. Saturday Morning I delivered 2 art pieces for the Arts and Business Visual exhibition at the Aston Business School. Normally I deliver the work a few days before the installation date to The Framers in the Custard Factory and that’s all I have to do, they install the exhibition and next time I see it is at the private view a few weeks later. However, this time the printing of one of the pieces was held up because the inks in the printer have been changed, that’s not just replacing a cartridge with the same cartridge, no, in January 2009 Action Graphics invested in a major upgrade to the inks for the machine that prints my images onto glass. Anyway all this extra work for Martin who prints my images onto glass for me has meant that deliver took a little longer. Because I didn’t want to rush this important process I arranged to take the work direct to the venue. And there alongside the new work was Shared Earth which the Business School purchased last year, I have never seen the piece in situ at the University so it gave me the opportunity to record the work on the wall. I'm John Garghan an artists based in Birmingham, United Kingdom.